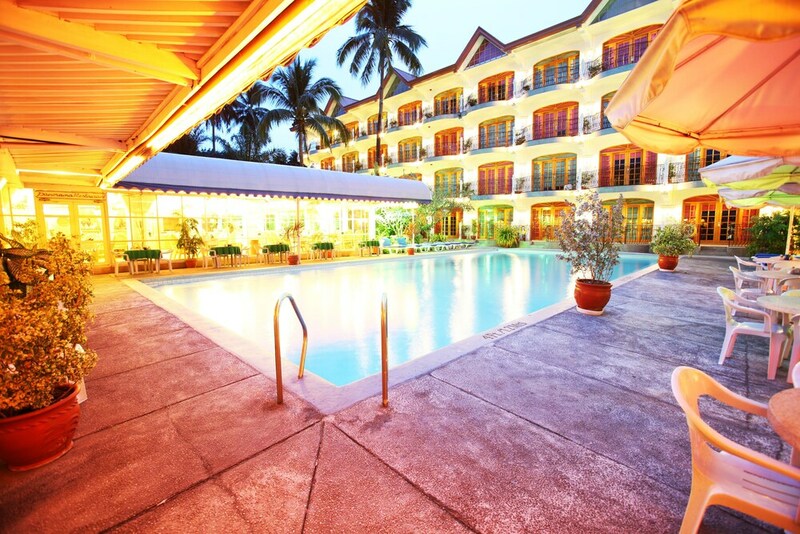 Situated in Mabalacat City, this hotel is within 1 mi (2 km) of Clark Freeport Zone and SM City Clark. Walking Street and Casino Filipino are also within 3 mi (5 km). A restaurant, an outdoor pool and a fitness centre are available at this hotel. Free WiFi in public areas and free self parking are also provided. Other amenities include a bar/lounge, spa services and 24-hour room service. All 99 rooms offer free WiFi, 24-hour room service and LED TVs with cable channels. Minibars, electric kettles and free bottled water are among the other amenities available to guests. Clarkton Hotel features an outdoor pool and a fitness centre. The hotel offers a restaurant. A bar/lounge is on site where guests can unwind with a drink. A computer station is located on-site, and wired and wireless Internet access is complimentary. This 3.5-star property offers access to a business centre and a meeting room. This business-friendly hotel also offers spa services, gift shops/news stands and karaoke. On-site self-parking is complimentary. Clarkton Hotel has designated areas for smoking. Buffet breakfasts are available for a surcharge and are served each morning between 7 AM and 1:00 PM. Clarkton Hotel has a restaurant on site. Start your morning with a buffet breakfast, available each day from 7 AM to 1:00 PM for a surcharge. You can order a meal from 24-hour room service. Rollaway/extra beds are available for PHP 500 per night. This property offers transfers from the airport. Guests must contact the property with arrival details 48 hours prior to arrival, using the contact information on the booking confirmation. Pool access available from 7 AM to 10 PM. Only registered guests are allowed in the guest rooms. Set meals are served in guest rooms only (no menus or public dining).